Anti-friction rolling element bearings selected to provide specified L-10 life and accept an application’s external loads. Heavy duty fabricated steel housing with internal bearing support pedestals where necessary. Lubrication systems: internal splash lubrication or shaft/motor driven pump systems; air/oil or water/oil heat exchangers where required; oil filters; teleflow indicators; sight feed oilers when specified. Designs to meet all critical mounting dimensions of existing drives. 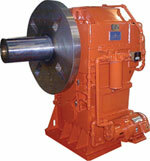 Redesigned gearing to provide additional power transmission capability. 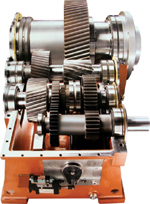 Revised gear ratios to accommodate new process requirements. 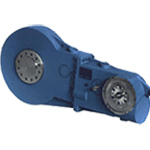 Redesigned bearing arrangements to provide equal or higher life expectancy at the higher power ratings and speeds.